Guest post: Is the NZ left on the blogosphere too effete? Often we get comments that are worthy of posts in their own right. I’m upgrading Tom Semmens’ comment on my post on Chris Trotter’s return to the blogosphere, because I agree with the point he’s making, and because it’s important and original. Enjoy! The reaction to Trotter has been fascinating. The right has reacted hysterically — but given the general paranoid style of the right blogsphere that is hardly a surprise. What has really been interesting has been the left-wing reaction. To my eyes the comfortably middle-class left-wing toffs of places like Public Address, and the intellectually lofty norightturn or feminist sites have reacted with marked hostility to Trotter’s cloth cap realpolitik. Trotter himself remarked on NatRad that he thought the blogosphere to be a largely irrelevant place to lives of real working class New Zealanders, and at first blush you would have to agree with him. It seems to me that the blogosphere consists of about 10% of the population – the Chardonnay socialists and the ACToid bully boys. However, Trotter in those comments missed the importance of who is on which side of the digital divide when it comes to influencing opinion makers. When the Labour Party looks at reasons for its defeat this year, the role of Limbaugh-like right-wing attack sites in setting the agenda of the debate has to addressed. It seems any cursory reading of the musing of political editors and op-ed writers in our major daily papers would indicate that they are no longer just interviewing their typewriters – they have web browsers and they often are regurgitating right-wing attack talking points. The use of Cameron Slater and David Farrar’s sites to launder sexual smears and whispering campaigns into the mass media is now documented. David Farrar has managed to use his blog as a launching point to pass himself off as an independent commentator in the wider media, and if the web stats are to be believed the sleazy Slater has one of the most read blogs in the land. The general online “left-wing” response to all this has been tardy, and a lot of the leftists frankly come across as a lot of intellectually elitist pussies. A good example would be the over-intellectualising tosh served up by Deborah over at “in a strange land” that saw her end up voting for the Maori Party. Another would be the flaccid and half-hearted political energy this time round of Russell Brown over at Public Address. The left — that is, the left that rolls up its sleeves and gets involved with real workers at trade union and party activist levels — has to develop a far more vigorous and street fighting response online to set the agenda of opinion makers, and that is why I think pseudo-left’s general nose holding reaction to Trotter’s aggressive and thematically cohesive writing is symptomatic of how and why the right came to dominate the op-ed agenda on the internet and onto the mass media. Chris Trotter started blogging just a couple of months ago, and, predictably, was an overnight sensation. The winning way with words, the sometimes deeply insightful, sometimes downright provocative, commentary won him legions of fans and enemies and a big slice of the blogging action in our corner of cyberspace. Some of his posts, such as the review of the ill-fated City Vision administartion in Auckland City, were sublime. Then, after the election, he swore off blogging. Now he’s back! Here. The new blog is named after the North Otago road that leads to the farm where he spent much of his childhood. (Homepaddock seems to be familiar with the area.) In keeping with the arcadian theme, the blog is intended as “an outlet for his more ruminative and eligaic impulses.” Reflective, in a word. Welcome back, Chris. I look forward to being variously entertained, challenged, enlightened, inspired and appalled. An especially sad example is his removing mention of Caughey being awarded Metro’s Aucklander of the Year — shortly after her defeat last year. A reader has noted that Bhatnaghar’s alias of ‘Barzini‘ is a psychotic mafia boss in Mario Puso’s The Godfather who seeks to extend his evil empire through dirty tricks and ruthless violence. It is also the name of a well known gay night club in Montevideo. Russell’s post deserves the widest readership. Some of us have been prepared, even in the face of growing incredulity, to let the processes of the law take their course before pronouncing judgement on Winston Peters. You know, innocent until proven guilty, a cornerstone of our legal system. As a result we cannot be accused of incorrectly accusing him of lying when he said “NO”, the large donation to NZ First revealed by party president Dail Jones did not come from Owen Glenn. Nor of incorrectly accusing him of lying when he said that donations from Sir Robert Jones reached NZ First. Others can be. However, NZ First’s repeated failure to declare donations from the Spencer Trust is difficult to fathom and impossible to excuse. A complaint having been made, the Police must expeditiously decide whether to lay charges; and this time, ignoring a blantant breach of the Electoral Act would be unforgiveable. Further, Peters must have known that NZ First had not been complying with its legal requirements on disclosure when he howled time and again that it was “assiduously at all times” doing so. After all, it was the Party’s failure to comply that gave rise to these controversies. Peters must have known about the failure to comply. He must have been lying. Peters and NZ First stand condemned not of excepting large anonymous donations — theirs pale into insignificance compared to National’s — or of keeping these secret through shady trust funds — ditto — or even of making mistakes in declaring incomes or expenses in the recent past — eveybody is guilty of that. But of lying about it. There is now more than enough proven to justify cutting Peters loose. NZ First has fessed up to omitting to declare a donation they received from Sir Robert Jones, noted pugalist and property developer (and at the same time a donation of the same amount from an anonymous donor). It says that this resulted from an administrative error that came at a time when there was an extensive changeover in administrative staff. This is not a trivial matter, and would have been a serious breach of the Electoral Act had it been investigated within six months of it happening. However, mistakes do happen. The National Party had to fess up to receiving an advantage of more than $100,000 at the last election because of administrative error. “[The explanation] fails the credibility test on so many levels, it is not funny. 1. The TV3 item on the Spencer Trust showed a payment of $50,000 not $25,000 paid to NZ First. Umm, yes, there were two donations of $25,000, and $25,000 times two makes $50,000. They admitted not declaring either. Strike one, DPF. 2. NZ First has never ever declared a single donation from the Spencer Trust, so are we to believe that in three years of existence it has only received and passed onto NZ First a singular donation from Bob Jones? No, you are expected to believe that the others were $10,000 or less. On the evidence of the Vela cheque for $9995, this doesn’t seem unreasonable. Strike two, DPF. 3. NZ First claim to have only had a couple of donations over $10,000 in the last decade, so how one could overlook your largest ever donation since 1996 is beyond belief. 4. Since the Jones donation was exposed a couple of months ago there has been speculation that the NZ First 2005 return may be inaccurate. Why did no one in NZ First check until today? Fair question, but what’s the point of it? Perhaps you should ask the NZ First auditor. Who knows, there may even be a reasonable explanation. 5. Why is the auditor, not the accountant, explaining the error? Are they the same person as suggested in the NZPA report? A fair person would be hard put to argue that this issue means that NZ First’s explanation “fails the credibility test”, DPF. But then, you’re not being a fair person here are you? Postscript: I’d like to know who leaked the details about Glenn’s letter to the Parliamentary Privileges Select Committee, and efforts to get him to talk to the Committee via video conference call, to the Herald. It is supposed to be a fair and unbiased process, after all. 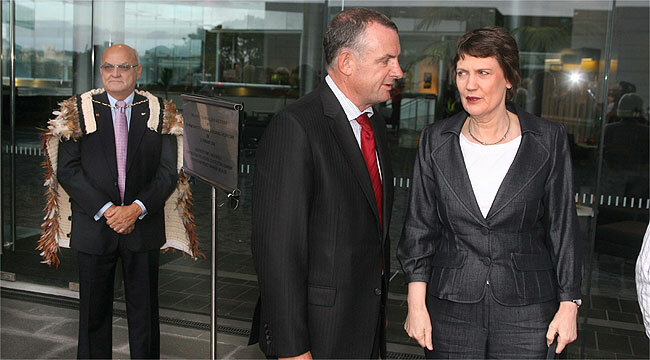 Firstly, Peters’ initial denial was in response to claims that NZ First had received a donation of $100,000 from Glenn. It hadn’t. That is the fact that has been established. Farrar is wrong. Well, Peters was right. Dail Jones was wrong. Glenn donated the money to Peters’ legal fees fund. Glenn’s entitled to consider that he donated the money to NZ First, and I’m entitled to think that, as Glenn is not precisely correct about this and other details — does anyone really think that Clark offerred Glenn the post of Minister of Transport? — he could be mistaken about who asked for the money. Motivation is not necessarily a factor, despite what Farrar would have you believe. Has the snub come back to bite? “Now, I’m not suggesting the allegations against Peters are not serious. They are. But they are being investigated by both the Serious Fraud Office and Parliament’s Privileges Committee, and all will come out in due course. Police have arrested a 61 year-old Taranaki man in relation to the white powder scare at the Beehive last month. In passing I would note that, while I agree with the tenor of Idiot’s original post, “This is what happens when you pursue a conscious strategy of whipping up hate and pandering to extremists … in New Zealand we’re lucky that it just leads to extremely obnoxious pranks”, the only two political assassinations in this country — apart from the more-or-less accidental death of Fernando Pereira — were of trade unionists. Frederick John Evans in 1912 and Ernie Abbott in 1984. RIP. Update: That said, whipping up hate and pandering to extremists doesn’t just apply to the right, as Redbaiter points out in a comment below. Louis Farrakhan? Seems Irish Bill at The Standard had the same thought. Okay, we’re talking the US here and not NZ. Here the National Party gave its (unpaid) house blogger a pass to cover its conference and access the free bar, but denied Standardista Clinton Smith credentials. NZ journos have only just started to notice the new kid on their block, as the recent confusion over shifting roles shows (here and here). The major parties in the US gave press credentials to bloggers first in 2004; a dozen (GOP) and 35 (Dems) only. This year the GOP is handing out credentials to 200 bloggers. Bloggers covering the Democratic Convention get either a “national credential”, providing the same access as members of traditional news media receive, or the more coveted “state blogger credential”. The latter allows one blogger per state to cover the convention alongside its state delegation, with unlimited floor access. Take note old media in NZ. It may not happen this election, but if you want to see the future, you know where to look. Well, it was going to happen sooner or later. At my request Chris Trotter has listed my blog on his blogroll and included my name alongside. He has little time for pseudonyms, which is how it should be, and would be in a perfect world. How does it feel being exposed for who I am? Well, it does feel very exposed. Not so long ago someone wrote something quite threatening on kiwiblog. For no reason. Such people do exist in the blogosphere, and when I read the comments in question I understood why the contributors to some left-wing blogs (and possibly right-wing blogs) prefer anonymity. While I wish that Chris had asked before doing this I am not unhappy. But I shall continue to blog under the alias “jafapete”, because that name has some recognition in the blogosphere. On another note the TUMEKE rankings have come out and they put me at #30 for July. So I was placed too high at #27 for “June”, and now I’m too low for “July”. The “Hit counter” that comes with the wordpress blog that I use shows clear gains in readers each month: 156 in April, 794 in May, 3211 in June, 6949 in July and 5417 so far this month. As of this minute, the Alexa rankings are 1,261 (NZ) and 880,944 (3 mo), which probably puts the blog in TUMEKE’s top twenty. And best of all the comments keep increasing! Thanks.